The Eastern Seaboard was home to all kinds of dinosaurs. For fossil-hunters intent on piecing together their story, the fossil record has been hard-won, fragment by fragment, footprint by footprint. The scene is the Late Triassic on the East Coast, in the area we know today as south-central Pennsylvania. The climate is warm and intensely seasonal. Hidden in the undergrowth of ferns and cycads, a small, nimble dinosaur browses on succulent leaves and an occasional fruit. At times, it rears up on its hind legs to look around or sniff the air for its predators. When the coast is clear, the 5-foot-long plant eater dashes out of its forest cover and sprints across the adjacent mudflat to sample leafy morsels in another grove of trees. 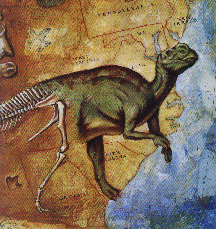 Paleontologists have been able to piece together this image of the Eastern Seaboard's earliest ornithischian dinosaurs from a handful of tiny teeth found in Pennsylvania and North Carolina, as well as from a variety of footprints and trackways uncovered up and down the East Coast. It is this intriguing combination--of abundant dinosaur footprints and rare, fragmentary bones and teeth--that perhaps best sums up dinosaur paleontology on the East Coast. Because the fossil record is so sparse compared with collections from the North American West, fossil hunters take great satisfaction in the discovery of a single bone fragment or a splintered tooth. Unlike the arid West, where wind, rain, and snow constantly erode broad areas of sedimentary rock, the East's abundant rainfall results in vegetation--vegetation that quickly claims most exposures and slows or halts the erosion that makes fossil discovery more likely. Many historic eastern dinosaur sites are now virtually impossible to locate, lost beneath a blanket of weeds, shrubs, trees, and leaves. Fossils in many areas of the East continue to be buried deeper under layer upon layer of dead organic matter. In addition to the accumulating topsoil, there's the obscuring effect of the vast carpet of concrete and asphalt that increasingly paves the East's growing megalopolis. Despite such challenging conditions, fossil hunters have made, and continue to make, important discoveries up and down the East Coast. Most fossils have appeared as by-products of excavations: for tunnels, road cuts, quarries, bridge foundations, water wells, and canals. In the course of surface mining for iron ore during the 18th and 19th centuries, for example, so many fossils were found in the corridor between Washington, D.C., and Baltimore that the area came to be nicknamed "Dinosaur Alley." In Connecticut, a sandstone quarry yielded three skeletons of prosauropod dinosaurs during the late 1880s. More recently, workers constructing a nuclear power plant in Pennsylvania uncovered a series of dinosaur tracks on sandstone buried 22 feet beneath the earth. On the pages that follow, you'll find highlights of these and other discoveries, as well as some tips on how to join the great East Coast fossil hunt. In the spring of 1802, young Pliny Moody was plowing a field on his father's farm in South Hadley, Massachusetts, when he turned up a slab of red sandstone imprinted with mysterious tracks. By Moody's account, the 12-inch-long prints were "three-toed like a bird's," and he proudly installed the slab as a doorstep. Though religious authorities attributed the tracks to "Noah's raven" (which apparently rested at South Hadley before resuming the long journey back to the ark), in fact Moody's discovery represented the first dinosaur footprints discovered in North America. They were later thought to have been made by a large, crocodile-like reptile, which paleontologists named Otozoum moodi in the young farmer's honor. On August 24, 1966, workmen made a remarkable discovery while excavating a site in Rocky Hill, Connecticut, near Hartford, for a new State Highway Department testing laboratory. About 12 feet below the surface was a rock layer that had held a secret treasure for 185 million years: hundreds of three-toed footprints ranging from 10 to 16 inches long. When paleontologists examined the site, they found nearly 1,500 well-preserved tracks and dozens of trackways, most made by a theropod dinosaur approximately 8 feet tall and 20 feet long. A later excavation at the site revealed an additional 500 tracks. Theropods ("beast foot") were the supreme hunters of the Mesozoic, the fiercest of all land-living predators. They may also have been swimmers, according to a curious trackway on the new exposure. The series of imprints suggests a dinosaur paddling along in shallow water, kicking the muddy bottom with the tips of its toes, concluded paleontologist Walter P. Coombs, Jr. in 1980. For track sequences that end abruptly, the theropod may have been buoyed up while swimming so it temporarily lost contact with the bottom. Since 1968, the Rocky Hill site has been preserved for posterity as Dinosaur State Park. A wealth of dinosaur trackways found in 1970 near Holyoke, Massachusetts, hold a special place in East Coast dinosaur paleontology because they may provide rare evidence for flocking or herding behavior in theropods. The track-bearing surface in the Mt. Tom area is approximately 150 feet long by 60 feet wide, populated by at least 134 three-toed footprints ranging in length from 3.5 inches to 13.8 inches. The theropod dinosaur trackmakers are the same cast of characters who left footprints in the Connecticut Valley during the Early Jurassic: Grallator and Eubrontes. Judging from the size of the prints, it appears that the bipedal Grallator was 7 to 20 feet long. Yale paleontologist John Ostrom identified 28 separate trackways, and approximately 70 percent (mostly Grallator) are oriented in nearly parallel courses, suggesting that these dinosaurs were traveling together in a large group across a broad mudflat. During a brief period in the late 1800s, the Wolcott Quarry in Manchester, Connecticut, produced three skeletons of Early Jurassic prosauropod dinosaurs--a feat that has not been equaled before or since. The plant-eating prosauro-pods were among the largest dinosaurs of their time. They measured 23 to 30 feet in length, and many could reach leaves and fruits as high as 13 feet above the ground when they rose up on their hind legs. The best-known prosauropod from the eastern United States was Anchisaurus ("near reptile"). Like all prosauropods, it had a long neck and tail, a small and lightly built head, and simple teeth. The first prosauropod skeleton was discovered on October 20, 1884, when workmen excavating sandstone from the quarry discovered fossil bones of the hind limbs and pelvis embedded in a large stone block. Unfortunately, the blocks likely to contain the skull and forelimbs had already been removed and built into the abutments of a bridge in South Manchester, four miles south of the quarry. The story might have ended there, except for the efforts 85 years later of Yale's Ostrom. "Ever since 1884," he wrote, "curators of vertebrate paleontology at the Peabody Museum have kept a hopeful eye on the brownstone bridge in Manchester, waiting for its demolition." The long wait came to an end in August 1969, when the 40-foot-long bridge over Hop Brook at Bridge Street was finally demolished to make way for a new span. Ostrom and his team from the Peabody Museum were on the scene to search for the missing blocks. They examined 400 sandstone blocks over a two-day period, and found two blocks that contained fossil bone. One of the 500-pound blocks held the missing half of the right femur of Ammosaurus major, which has since been reunited with the original skeleton at the Peabody Museum. The second skeleton recovered from the quarry remains the most complete and best-preserved skeleton of a prosauropod dinosaur ever found in North America. The first nearly complete dinosaur skeleton in the world was found in New Jersey and described in 1858. Twenty years earlier, workers excavating marl for fertilizer hit a cache of ancient bones on the property of John E. Hopkins in Haddonfield, just east of Philadelphia across the Delaware River. The fossils lay in Upper Cretaceous marine sediments, and most were huge vertebrae. Unfortunately, as was later reported, "Mr. Hopkins, being young at the time of the discovery, and not specially interested in such subjects, had permitted visitors to carry away the fossils." In 1858, gentleman naturalist William Parker Foulke heard about the bones while summering in Haddonfield. Based on recollections of its location, Foulke hired a crew to reopen the pit that fall. Approximately 10 feet down, they found a 75-million-year-old dinosaur fossil. "The bones are ebony black, firm in texture, heavy, and strongly impregnated with [iron] salts," noted University of Pennsylvania paleontologist Joseph Leidy, who lent his expertise to the excavation. Leidy immediately noticed "the great disproportion of size" between the front and back parts of the skeleton. That was all the evidence he needed to describe for the first time a dinosaur that walked on two legs: "[It] leads me to suspect that this great extinct herbivorous lizard may have been in the habit of browsing, sustaining itself, kangaroo-like, in an erect position on its back extremities and tail." Hadrosaurids had long, deep tails, which they held nearly horizontal to counterbalance the front of the body. They may have cruised the countryside at 9 to 11 miles per hour, and they appear to have been capable of 29 miles an hour over short distances, especially when chased by a large predator. Known as the best chewers of the Mesozoic, these plant eaters consumed great quantities of highly fibrous foliage. In 1868 Hadrosaurus foulkii became the first dinosaur skeleton ever mounted for exhibit at the Academy of Natural Sciences of Philadelphia. The exhibit proved to be one of the most popular in Academy history, increasing attendance by as much as 50 percent. Hadrosaurus foulkii was subsequently designated the official "New Jersey State Dinosaur" in a bill signed by then-governor James Florio on June 13, 1991. In the summer of 1980, Robert K. Denton Jr. and Robert C. O'Neill went prospecting for fossils along Crosswicks Creek in Ellisdale, New Jersey, an area long known for yielding Late Cretaceous dinosaur fossils. Along a tributary to the creek, they found lignitized wood and pieces of fossil bone, eroded out of the steep banks. Over the next four years, after each heavy rain, they visited on weekends and collected dozens of vertebrate specimens. That inventory alone made Ellisdale one of the most important new Late Cretaceous fossil sites on the East Coast. But Denton and O'Neill were in for a pleasant surprise. In March 1984 a torrential storm dumped nearly 8 inches of rain on central New Jersey, and the little tributary at Ellisdale roared to life. When the "two Bobs" later checked their site, they found the streambed littered with bone fragments. Within a month, they had collected 300 specimens of dinosaurs, turtles, crocodiles, bony fishes, lizards, and mammals. To date, more than 10,000 specimens have been recovered. Ellisdale is known as a "microfossil" site. There are no skeletons or whole bones to be found. These specimens were broken into small pieces as they were transported to their final resting place 75 million years ago. Denton pictures the site in Late Cretaceous time as a channel or lagoon shoreward from a barrier island system, with sediments deposited by powerful storm surges from the sea. By digging out the dirt, hauling it home in bags, and sifting every ounce, Denton and O'Neill have found teeth and bone fragments representing at least three Late Cretaceous dinosaurs, including Dryptosaurus, Hadrosaurus, and Hypsibema. Though Delaware has many of the same Upper Cretaceous formations that have produced an abundance of dinosaur fossils in New Jersey, there are virtually no natural exposures of those sediments in the state. The only location in Delaware where dinosaur fossils have been found is along the 19-mile Chesapeake and Delaware Canal, which connects the Chesapeake Bay with the Delaware River. The canal angles across a belt of southward-trending Cretaceous formations. These fossils have come to light in the "spoil" dredged from the canal and piled on its banks. At least three hadrosaurid teeth have been found at the canal in spoil from a major Army Corps of Engineers dredging project in the winter of 1984-85. Other remains include several toe bones from ornithomimosaur dinosaurs and a partial hadrosaurid vertebra found in 1982. The Empire State yielded its first dinosaur fossils in 1972, when Paul Olsen and Robert F. Salvia discovered footprints at Nyack Beach State Park in Haverstraw, Rockland County. Rock slabs taken from the site and now at the New York State Museum reveal typical Grallator footprints. There are at least two crossing trackways, with individual prints ranging in size from 5 to 6 inches. No body fossils of dinosaurs have yet been found in New York. On November 9, 1981, workmen interrupted their work on the nuclear-powered Limerick Generating Station when they discovered "horse prints" on a sandstone rock layer exposed during blasting for a spray pond. About 500 feet from the distinctive cooling towers at the $5 billion Philadelphia Electric Company project, they removed 18 track-bearing slabs from approximately 22 feet below the ground surface. At least two different reptiles are represented by the 190-million-year-old prints, identified as originating during the Late Triassic. The most abundant are the three-toed therapod dinosaur prints known as Grallator. The Philadelphia Electric Company donated most of the tracks to schools and museums. In the corridor between Washington, D.C., and Baltimore, so many Early Cretaceous dinosaur fossils were found in the course of surface mining for iron ore in the 18th and early 19th centuries that the area was nicknamed "Dinosaur Alley." Today, Maryland remains the only source of Early Cretaceous dinosaur fossils on the East Coast. The area that produced the bulk of Maryland's dinosaur fossils in the last century is still the source of nearly all Early Cretaceous collecting in the state: Muirkirk, south of Laurel, in Prince Georges County. The second major find occurred in May 1991 when Arnold Norden and his children, Heather and John, were prospecting the site and they happened upon the end of a huge Astrodon femur exposed by the clay quarrying operations. Now on display at the Smithsonian, the 4-foot fossil--part of an original femur estimated at 6 feet long--is the largest dinosaur bone yet discovered on the East Coast. The third significant discovery at the quarry was made by Kranz in May 1992, when he located the only associated dinosaur bones ever found in the Early Cretaceous of Maryland. The theropod material consists of the upper region of the tibia and an assortment of toe bones, ribs, and other skeletal remains. The nation's capital has twice yielded dinosaur fossil finds. In 1898 workmen installing a sewer line at First and F Streets SE came upon a vertebra and bone fragments of a large carnivorous dinosaur. The other Washington discovery was made in 1942, when a large Astrodon thighbone was uncovered during construction on a water filtration plant at First and Channing Streets NW. According to vertebrate paleontologist Charles W. Gilmore, the bone belonged to a sauropod "about 10 feet high at the hips and 50 or 60 feet long, weighing approximately 10 tons. Apparently, from the geological evidence, it was trapped in a small pond or mudhole and so perished." These coincidental finds of fossils were typical of dinosaur paleontology on the East Coast in the first half of the 20th century. Scientific attention had shifted to the highly productive fossil fields of the western United States and Canada, and collecting languished in the eastern states. The quarrying industries that had opened so many prime exposures in dinosaur fossil-bearing sediments in the 1800s gradually shut down. It wasn't until the 1960s that scientific collecting was revived on the East Coast. In the rolling horse country of Loudoun County, dinosaur footprints were found near Aldie at Oak Hill, the home of President James Monroe from 1808 to 1831. The stately brick mansion underwent extensive renovation about 1920. As part of this work, its walkways and beautiful terraced gardens were paved with flagstones quarried from the northern border of the huge estate, about a mile from the main house. When workmen began laying the slabs, they noticed raindrop impressions; ripple marks; and birdlike, three-toed footprints in the flagstones. The dinosaur tracks range in length from about 5 to 13 inches. The distinctive footprint-bearing slabs are still in place today, and a trackway of four prints is actually inside the mansion, on the flagstone floor of an enclosed side porch. In 1985, Norma Kay Pannell identified the theropod trackmakers Grallator and Eubrontes at the site. A short trackway reveals a Grallator-like dinosaur, 21 inches high at the hip, trotting along at four miles an hour with a 40-inch stride. David B. Weishampel, associate professor of cell biology and anatomy at Johns Hopkins School of Medicine, is senior editor of The Dinosauria and coauthor of The Evolution and Extinction of Dinosaurs. Luther Young, a former science writer for the Baltimore Sun, is senior science writer at Hopkins's Applied Physics Laboratory. Dinosaurs of the East Coast (Johns Hopkins University Press, 1996) can be ordered by calling 1-800-537-5487.